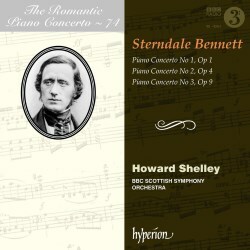 Hyperion has reached Volume 74 of its series “The Romantic Piano Concerto” and here offers Sir William Sterndale Bennett’s Piano Concertos 1-3 with Howard Shelley. The Fourth Piano Concerto with Shelley in 2007 was on Volume 43 - review. Sterndale Bennett had a very English early career; born into a musical family, he entered the choir at King’s Cambridge as a chorister before becoming an organ pupil, then entered the Royal Academy of Music at the age of ten. All three of these concertos were written while he was still a student at the RAM, and were premièred in 1832, 1833 and 1835. Sterndale Bennett’s models, as we might expect at that date, ranged from Mozart to Mendelssohn. If the music is hardly in the class those two achieved as mature masters (whose is? ), he was almost in their league as a prodigy, and these pieces are rather more than parochial English curiosities. The First Concerto is in D minor and the CD booklet notes mention its relation to Mozart’s Don Giovanni and D Minor Piano Concerto K466. Sterndale Bennett has not that degree of demonic power in his artillery or his ambition, but this is still quite a work from a sixteen year old. The ideas are reasonably attractive, the form is persuasively handled, and there is a pleasing fluency and invention in the piano writing, and an energetic scherzo finale. It seems there was to be a fourth movement that was dropped, and if so that showed good judgement. The concerto as it stands runs for just over twenty-three minutes and as a consequence the scale seems right for the material, none of which outstays its welcome. No wonder it so impressed its first audiences, as it seems did the young composer-pianist at the keyboard. The Second Concerto in E flat is a bit more ambitious in scale, and more of a virtuoso vehicle with greater display opportunities for the soloist. If some themes remain somewhat short-winded and regular, they are still quite attractive enough, and there is an enhanced sense of purpose in the narrative drive especially of the first movement. The adagio quasi espressivo second movement has a contrapuntal central episode whose invention is never merely academic. The jaunty finale too is enjoyably inventive, with some fine solo flourishes, but some extensive passages that show growing expertise in handling of the orchestra as well. The C minor Third Concerto is the work of an eighteen year old whose confidence has obviously grown. Its first movement is the most impressive of any on the disc. Sterndale Bennett made his 1837 Leipzig debut playing this work, and his friend Robert Schumann, in his review in the Neue Zeitschrift für Musik, spoke of its “euphonious language, its purity of thought”. The Romanza is a poetic nocturnal vision, and the finale a vigorous Allegro agitato that more than nods to Mendelssohn’s First Concerto, which had greatly impressed Sterndale Bennett. As we expect from his long and distinguished recording career Howard Shelley is immaculate in keyboard skills, adroit and engaging, and obtaining more expression at some moments than the material might at first seem to offer. He is also impressive in his now frequent dual role as soloist and conductor, drawing committed performances from the excellent BBC Scottish Symphony Orchestra. Above all the style seems perfectly judged throughout, as Shelley’s taste and discernment make an eloquent case for the music without imposing more weight than it will bear. Ultimately this music is worthy of an honoured place on the shelves. Only individual taste can decide whether it will also make frequent visits to the drawer of the CD player. Malcolm Binns has also recorded the Sterndale Bennett Piano Concertos but I have not heard his versions. Suffice to say that if you want all of the first three concertos on one CD this very well filled new disc can be strongly recommended. Jeremy Dibble’s excellent (and fairly technical) booklet note is another plus in what is after all still rare repertoire, giving interesting career context as a well as some analysis of each of the nine movements. The sound is well up to the high standard of the series and of the label generally.